I recently had the privileged opportunity to interview Jéleon Dijon. We discussed his highly anticipated debut as an published author. His book entitled "The Audible Heart: Speaking To You, For You"
will be available on June 1. First let's get to know Jéleon, how would you describe Jéleon Dijon? I describe Jéleon Dijon not only as a name from my great grandfather, but as a counterpart to who I am. Jéleon to me means the best of both worlds, good and bad. He's spontaneous and live and loves to take risks. Everyone has another side to them. Not to make them crazy, but to make them more unique and mysterious. What ispired you to bring "The Audible Heart: Speaking To You, For You" to reality? I started out with just writing and posting poetry on Facebook...it was favored by many people and they motivated me to begin writing my book. They saw that what I have to give can change many people's lives. How much of the book comes from personal experiences? Truthfully, little of the book speaks about my life personally. It has its testimonial parts but most of the book is generalized. I did that because I wanted to make sure that everyone can take a part of the book and apply it to their life in any way they see fit. But although the book is generalized you can tell I experienced it. 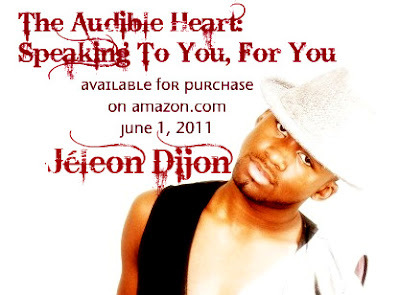 Now with "The Audible Heart: Speaking To You, For You" can your fan's expect for more from you? Most definitely! I plan on releasing a sequel to 'The Audible Heart...' don't have a title or date yet but you can surely quote me that I will continue to give my work to you. What was the hearest part of keeping the book relevant? Since you wrote the book in such a small time frame. The hardest part about keeping my book relevant was having to pay close attention to people. I wrote this book based off of general feeling so I had to examine everyone's tweets, Facebook posts, and overall feelings period. What did you realize about yourself while writing the book? I realized that my determination exceeds far beyond limitations of my mind when it comes to what I want to accomplish in my walk in life and I hope you all experience that in this book as well. It was great having this opportunity to talk with Jéleon! I've truly been anticipating the release of this book, since I first leaned of it months ago. I plan on ordering a few copies and I hope you do the same. This book will be available for purchase on Amazon.com June 1, 2011. So mark your calendars! You don't wanna be left out!